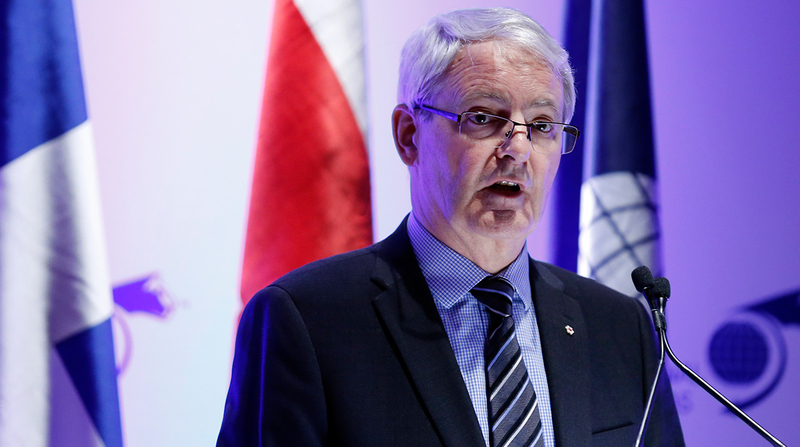 The movement of cargo offers vast possibilities for technological innovation, according to Canadian Minister of Transport Marc Garneau. Garneau hosted a press call April 9 after meeting with Transportation Secretary Elaine Chao and representatives of the Transportation Security Administration, the U.S. Coast Guard and U.S. Customs and Border Protection. Garneau said he is open to partnering with U.S. officials to pilot technology that would facilitate the movement of freight at the border. According to Garneau, some 30,000 trucks and 5,400 railcars cross the U.S.-Canada border every day. The Gordie Howe International Bridge and the Ambassador Bridge were topics of discussion at the meeting, according to Garneau. The Gordie Howe Bridge, which has been discussed for more than a decade, is projected to be constructed in the next several years. The Ambassador Bridge, located 2 miles downstream from the proposed site of the Gordie Howe Bridge, was the longest suspension bridge in North America when it opened in 1929, according to Detroit International Bridge Co.
Detroit International Bridge obtained a permit to build a replacement span of the Ambassador Bridge in September, and Garneau reiterated Canada’s demand that the existing Ambassador Bridge is destroyed once the new one is completed. NAFTA did not come up at the meeting, Garneau said, although “discussions are intense.” He said Canadian Foreign Affairs Minister Chrystia Freeland recently returned from Washington after a round of negotiations. Besides meeting with Chao and homeland security officials, Garneau attended a stakeholder lunch with members of the trucking, rail and air cargo industries to discuss NAFTA. Garneau initially was supposed to meet with Homeland Security Secretary Kirstjen Nielsen in addition to Chao, but he said Nielsen was called away at the last minute for another meeting. He noted that many of the issues DHS deals with fall under the purview of the Ministry of Transport in Canada. He said he and Chao mostly discussed “disruptive tech,” such as autonomous vehicles and drones. “Essentially, [we’re] focused on trying to make transportation as seamless as possibly between our two countries,” Garneau said.